We manufacture and assemble arrays of steering with microprocessor controller to all kinds and types of cranes. In accordance to diagram L.01 fulfils practically all requirements of occurred lift movements. 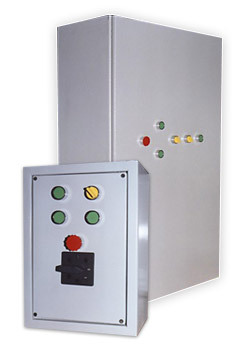 There is possibility of installation in personal and hospital lifts additional in each model the control system enabling smooth speed regulation of the cabin by mean of invertor system increasing the comfort of lift movements. Soft braking and starts of cabin from anz stop, accuracy of stoppage on proper level and limitation of energy consumption is the result of invertor application.